I have another new style of beer today, a California Common or Steam Beer. It amazes me that 225 beers in I can still be having unique styles of beer. 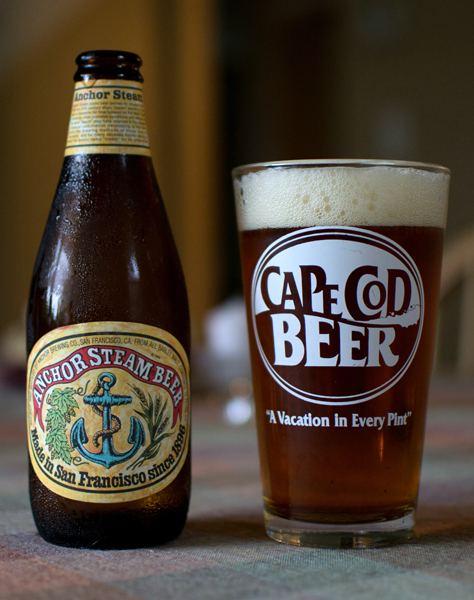 Beer #225 is Anchor Steam Beer by Anchor Steam Brewing Company from San Francisco, California. The ABV of tonight’s beer is 4.9%. So what exactly is a Steam Beer? Well the original Steam Beer brewed back in the the late 1800’s used a strain of lager yeast that worked better at higher temperatures since brewers had limited access, if any, to cold water or ice. To the pour…a beautiful amber color with a big fluffy white head. To the nose…very grainy, a touch of caramel malts, and something slightly fruity. To the taste…slightly sweet caramel malts make up most of the flavors, a bit of a bread thing going on and some slight, and I mean slight fruitiness, maybe citrus? To the mouthfeel…crisp, medium body, lively carbonation, clean and quite refreshing. To sum it up…solid. I liked this a bit better than their Summer Beer. One of the better lagers I have had for sure.